Sometimes our family is in the mood for something light and flavorful – and a hearty salad just fits the bill! But what flavors to combine? Wish-Bone® Italian Dressing and Tyson® Grilled & Ready® Chicken provides a meal full of protein with a kicking zesty flavor. The added fruit, bacon and veggies in this particular salad, really elevate it to entree status and make it a complete meal that will leave you craving more! Rinse and pat dry spinach, and put in a large salad bowl. Cook 1 piece of bacon and then crumble. Set aside. Slice rinsed Strawberries, mushrooms and red peppers. Combine fruit and vegetable slices on top of spinach. Cook Tyson® Grilled & Ready® Chicken according to package directions, and top salad with chicken while it’s still warm! 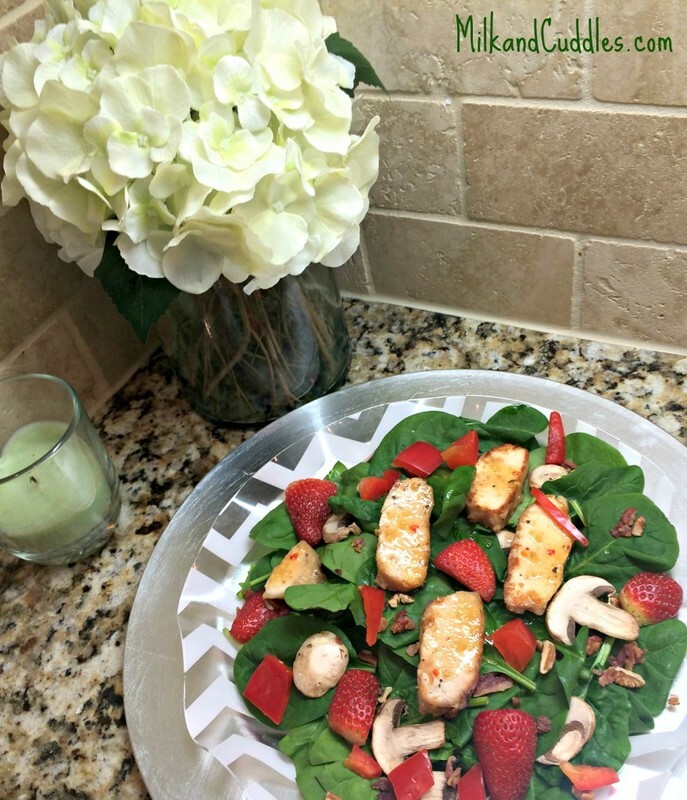 Drizzle salad with the zesty taste of Wish-Bone® Italian Dressing, and finally sprinkle with pecans! Dinner made simple. Enjoy the sweet, tangy, savory flavors of the strawberries, chicken, bacon and veggies topped with robust Italian Dressing! Make salad ahead of time, and then cook Tyson® Grilled & Ready® Chicken right before you’re ready to serve! 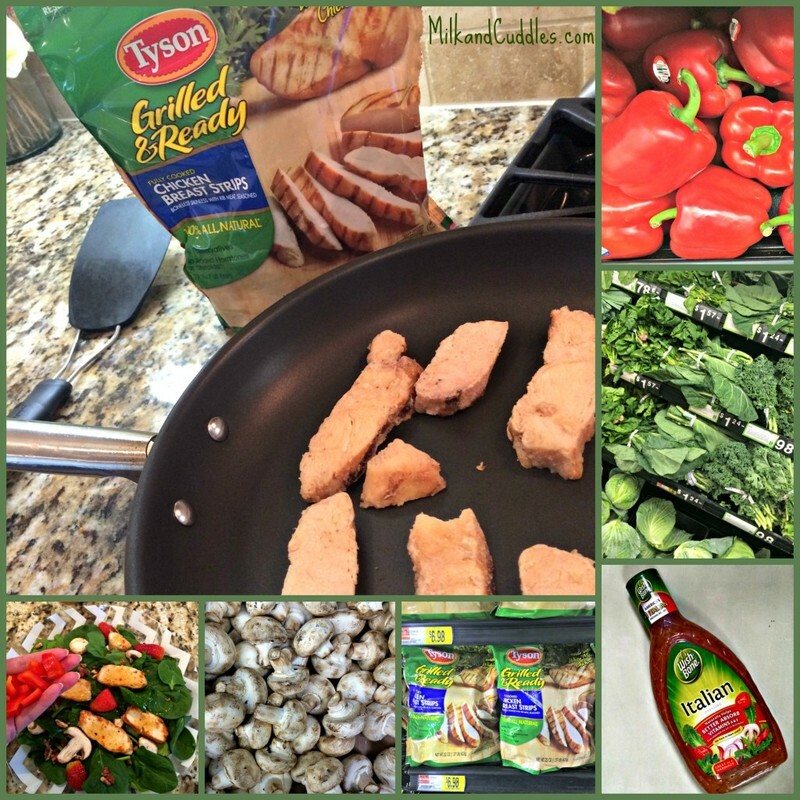 Tyson® Grilled & Ready® Chicken is also super yummy cold! Any nuts can be used in place of the pecans, I especially like slivered almonds! Pre-cooked bacon can be used instead of freshly cooked to save on time. Wish-Bone® Italian Dressing can be used as a marinade for the cooked Tyson® Grilled & Ready® Chicken, rather than drizzling on top of the salad. 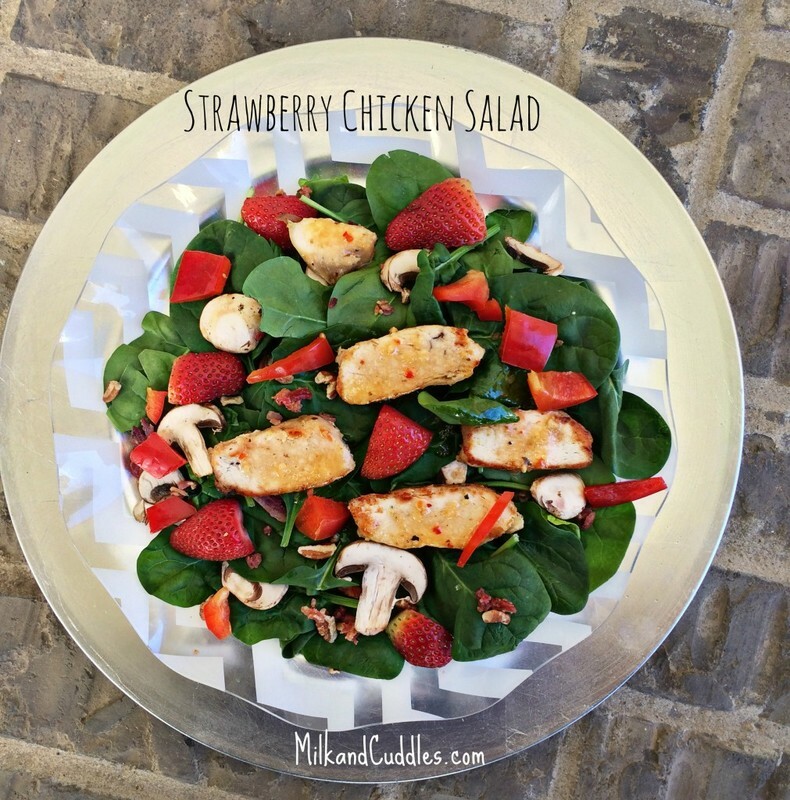 This Strawberry Chicken Salad is perfect for those days when you are running around doing errands or going to after school practices. It can be made ahead, and the ingredients are easy to find at your local Walmart! I was able to easily find the Wish-Bone® Italian Dressing in the condiment aisle of Walmart, and the Tyson® Grilled & Ready® Chicken in the frozen section. Sponsored post written by me on behalf of Tyson Foods, Inc. and Pinnacle Foods Group LLC. All opinions are entirely my own. Chicken with Artichokes & Capers! Easy Lemon Chicken Slow Cooker Whole Chicken Bacon Cheese Quiche – learn the recipe in less than two minutes!